Using Pilates for back strength and flexibility is one of the best ways to keep your back healthy and to ward off back pain and disability. 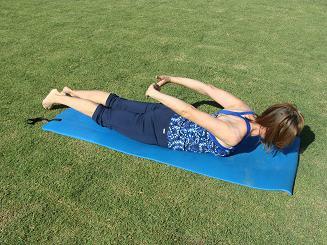 Pilates exercises are a great way to do low impact back exercises. Pilates works to open the vertebra in the back and other joints in the body while simultaneously strengthening the muscles that support the back. Some of the best workouts for lower back include Pilates exercises that work the deep core or transverse abdominal muscles that support and protect the back. 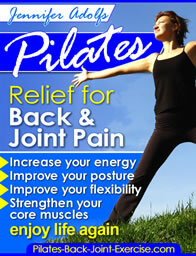 My site is full of Pilates for back, hip, and joint specific exercises. Let's look at a few of them here! Swimming or Leg Extensions lying prone are a great way to develop back strength using Pilates principles. Begin lying prone or face down with your legs long and arms extended over head. Hollow your pelvis by pulling your abdominals up and in until you feel your legs extend up off the mat. Alternate extending opposite arm and leg off the mat quickly like a flutter kick or more slowly and controlled. Breathe in and out getting more extension or lift on the inhale and more abs pulled in on the exhale. Work for 3-5 breath cycles. Kneeling Arm and Leg Extension is a great way to balance the muscles in the back and abdomen. Kneeling as shown, inhale as you extend one leg back and away keeping your hips parallel to the floor. Once balanced extend the opposite arm up and away as shown. Hold, then exhale as you release down and repeat on the other side. Repeat for 4-8 repetitions on each side. This low impact back exercise can be more challenging on an exercise ball. This Upper Back Strength exercise is not only good for strengthening the upper back, but also for improving your posture and stretching the chest muscles. Begin lying prone or face down as shown, clasp your hands across your upper back. Inhale to lift your hands up off your back pulling your chest up off the mat and legs lengthening up and away. Exhale to hold deepening your abdominal muscles, inhale again and then exhale to lower back down. Imagine lengthening your legs and head, chest, and ribs up off the mat. Find all my favorite Pilates for Back and Joints exercises in the newly revised Ebook here. The Pilates Cat Stretch is one of the best ways to work on back flexion and extension with control and breathing. Begin kneeling as shown with hands under shoulders and knees under your hips. Exhale as you press into your hands and arc your back tucking your tailbone down between your thighs. Inhale as you lengthen your spine releasing the tailbone and lifting your head and chest opening up the spine. This Back Extension Exercise is a great way to open the front of the spine and strengthen the back. Begin on your stomach with your hands under shoulders. Inhale as you begin to push into your hands peeling your head, chest, and ribs up off the mat. Feel your chest wide and shoulder blades set down the spine. Exhale to slowly peel your spine down the mat sequentially. Repeat for 6-8 repetitions or until your spine feels longer and stronger.